The second day of the nine-day Navaratri festival on Thursday was marked by the devotees thronging the four Mada Streets at Tirumala to have a glimpse of the Lord. 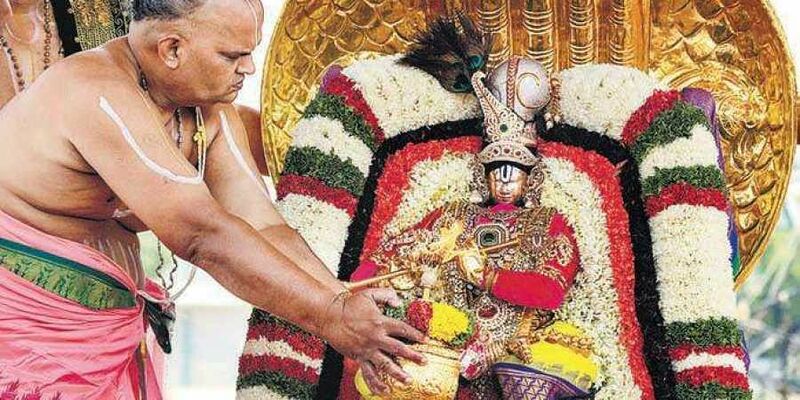 TIRUPATI: The second day of the nine-day Navaratri festival on Thursday was marked by the devotees thronging the four Mada Streets at Tirumala to have a glimpse of the Lord. The tiny processional idol of Lord Venkateswara was given a ride on Chinna Sesha Vahanam (Chariot of Snakes) in the morning. The chariot, piloted by a group of people performing various cultural activities, a visual treat to the devotees. The processional deity, decorated in the form of Lord Sri Krishna on the five-hooded golden Vahanam, also rode on the streets of Tirumala temple. TTD EO Anil Kumar Singhal, Chief Vigilance and Security Officer (CVSO) incharge Sivakumar Reddy, Temple DyEO Haridranath also took part. SPREAD HINDU DHARMA, SAYS JEO Tirupati: The Dharma Pracharaks of TTD should play an active role in spreading tenets of Sanatana Dharma among people, Tirupati JEO P Bhaskar said. Addressing trainee Dharma Pracharaks, at SVETA, on Thursday, Bhaskar said that as per directions of the EO Anil Kumar Singhal, the Dharma Pracharaks should focus on inculcating the basic tenets of Hindu Dharma among youth, school children and women. He said presently dharmic influence among the youth had been decreasing due to break in joint family system. POSTAL COVERS ON SESHA VAHANAM Tirupati: The India Post finally issued special postage covers commemorating all holy Vahana processions of Lord Venkateswara during the Navaratri Brahmotsavams. TTD Executive Officer Anil Kumar Singhal released the first in the series - special cover for the Pedda Sesha Vahanam, on Thursday, to commemorate the celestial vehicle of Pedda Sesha Vahanam. The postage cover with a special stamping of Pedda Shesha Vahanam with date and location of Tirumala comprised Shanku and Chakra, the signs of Lord Venkateswara. released. Another book was on ‘Pavitrokhyanam’, authored by Dr Nanduri RamakrishnaAcharya on the theme of Maharishi Markandeyas preaching to Dharmaraju with a foreword by Dr Malayavasini.